I know winter isn’t TECHNICALLY over until March, but I’m also pretty sure I’m not the only one who feels ready to move on to spring before the calendar tells us it’s okay. Post-Christmas, the house feels great for a few days with all the holiday decor packed away, and then it starts to feel a bit empty. But, unlike fall and Christmas, I don’t have totes full of spring decor in the attic to bring out for an instant pick me up. Maybe I should? I packed up the final remnants of winter today, but needed some inspiration before I could jump right into spring decorating. I was drawing a bit of a blank on what I wanted to add without spending a fortune. I searched around and pulled together some ideas for the main rooms in our house. Next week, I’ll show you how I implemented each of them in our house. Fun, right? Click the photo to go to the original source before pinning. Thanks! 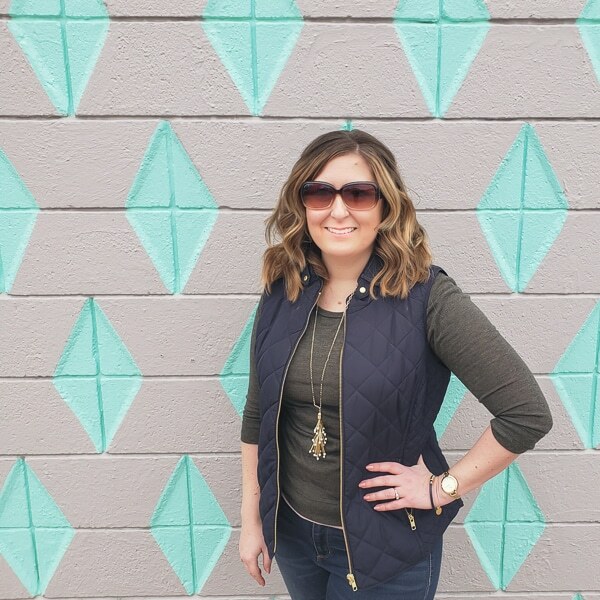 This spring home tour from Cassie at Primitive & Proper reminded me that a few fresh flowers go a long way in transitioning a home from winter to spring, no extra decor needed! I’m a big fan of grabbing inexpensive flowers at the grocery store. In addition to flowers, the other super easy grocery store item that can bring a room right into spring is fresh fruit. Heather from The Heathered Nest had a great example in her spring tour, using Cuties to add some orange. 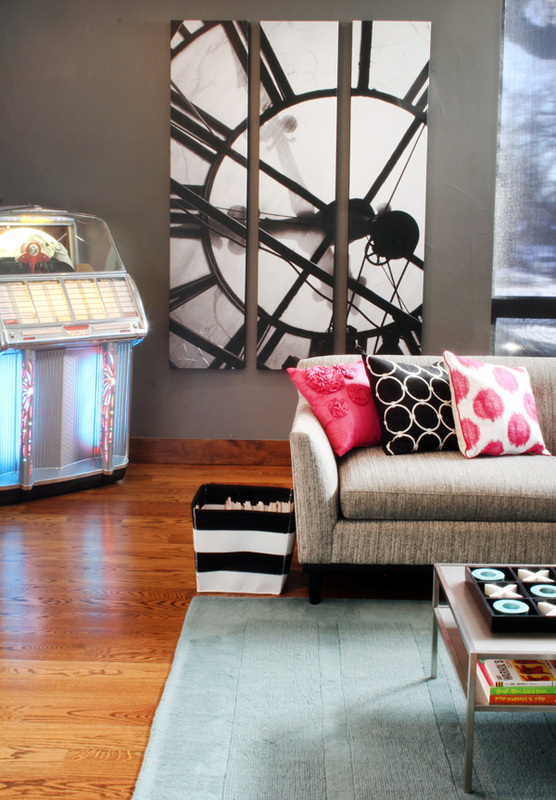 In the living room, changing out the couch pillows to something a bit brighter makes the whole room come alive. 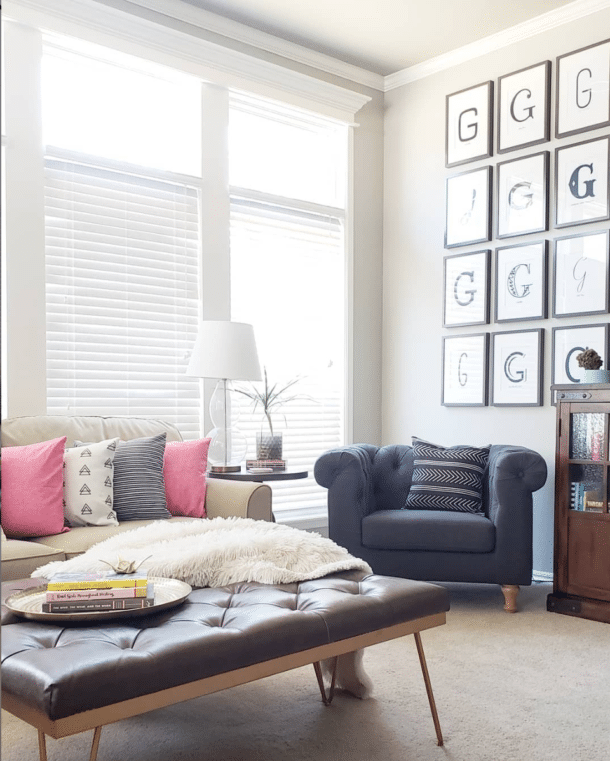 I’m a bit obsessed with pops of pink lately, so the pillows Angela from Blue i Style used in a recent home tour make me very happy! 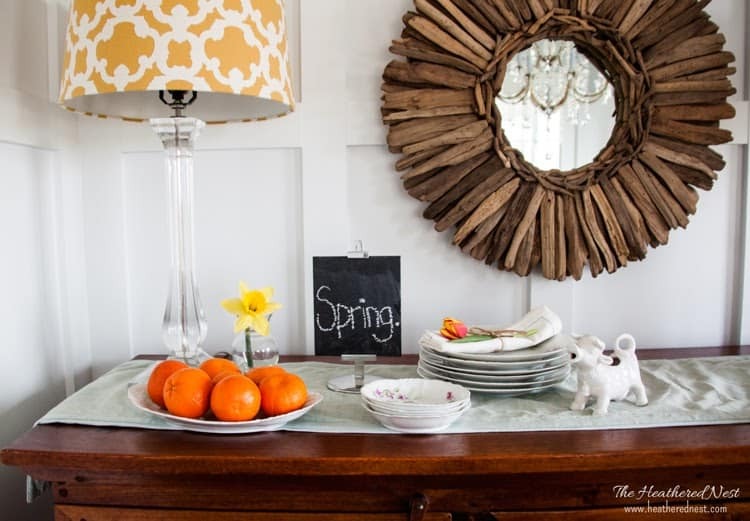 This pretty picture from Erin Spain’s Spring Home Tour demonstrates one of my favorite seasonal tricks. Displaying books with spine colors that fit the time of year is a free way to add pops of color. It’s unseasonably warm in Tulsa right now, so I feel like I’m ready to update the porch for spring. Sadly, this warm front won’t last and it’s too early for flowers, but as soon as it’s time, I’m ready! 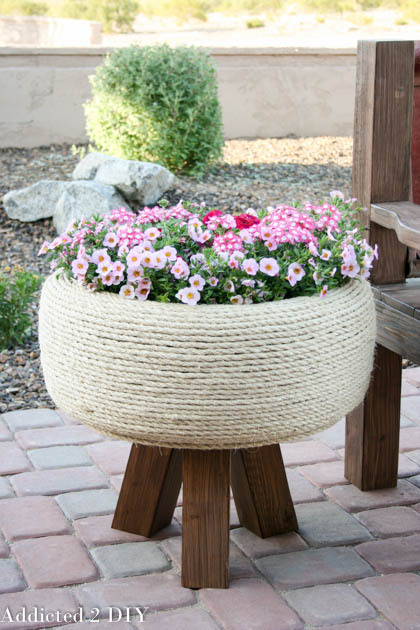 Katie from Addicted 2 DIY was challenged to upcycle a tire, and she ended up with a gorgeous planter. I don’t have a spot for a large planter like this, but it got my brain flowing with all kinds of ideas for updating the mish mash of planters I already have. 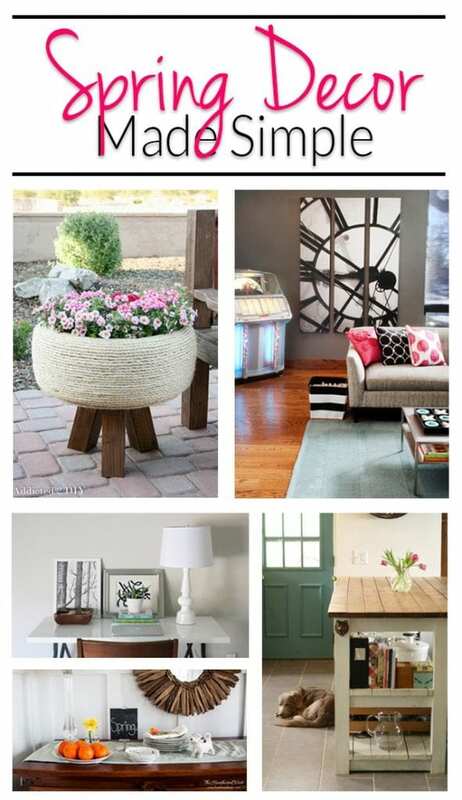 Once I started looking through all these home tours, I quickly remembered how simple spring home decor can be. It’s all about adding new life through flowers, plants, and even color. I can handle that! Now I’m off to implement these ideas in our house, who’s with me? Let’s kick winter to the curb! thank you so much for including my Spring kitchen in this round up! I am sure this year’s Spring tour will also rely on grocery store flowers as the snow is still out my window here! 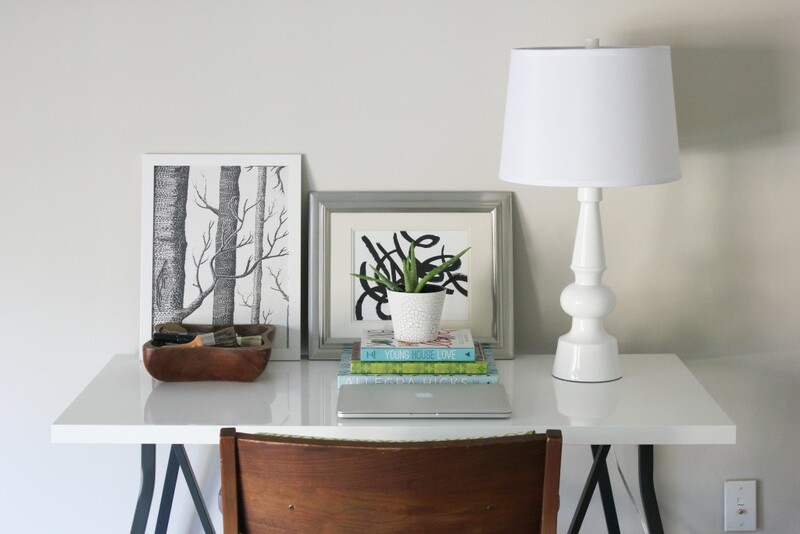 Thanks so much for including my desk in your post! I am SO ready for spring!